My son wanted a full-blown Star Wars The Force Awakens birthday party, since the movie came out on DVD right before his birthday and many of his friends hadn’t seen it yet… gasp! We decided to set up a large outdoor movie screen and watch The Force Awakens outside at night with lots of chairs, blankets, and treats. I knew it would be crazy with a big group of pre-teen boys running around, so I decided to keep the party simple. I knew I wanted a black space backdrop with stars, so I bought a black sheet at Walmart. I laid the sheet outside, then took splattered watered down white paint all over it. Doesn’t it look incredible? I’m blown away at how such a simple process can make such a cool backdrop! My son was thrilled with it, which was my ultimate goal. 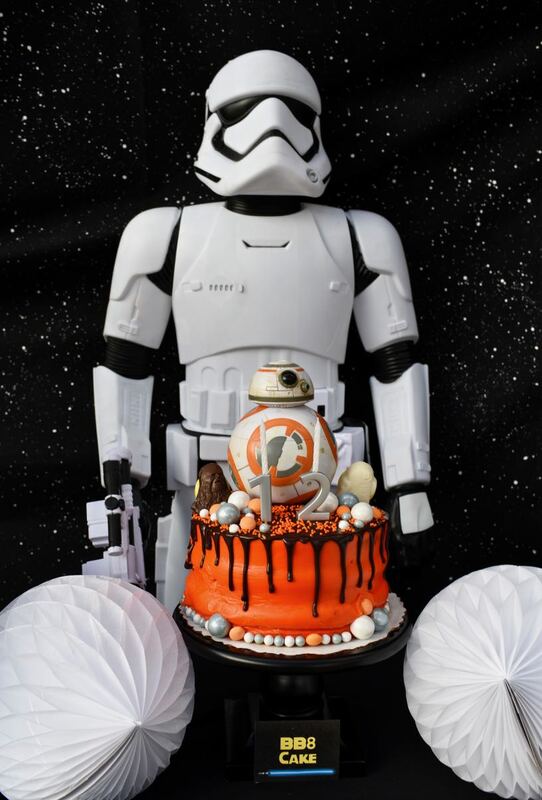 When I shared the Star Wars BB-8 cake I made on Instagram last year, everyone oohed and awed over it. It was my first drip cake ever, and I’m so happy with how it turned out! 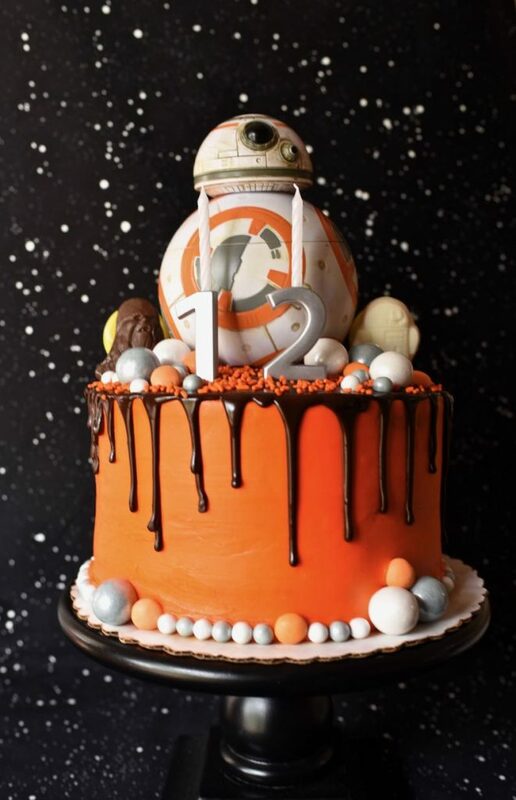 There are lots of fabulous details, as well as a few shortcuts I made to create the cake quickly and easily, but to still give it the WOW factor. First of all, I ordered a plain cake. From the Walmart bakery. Which means that I didn’t have to make it and it was inexpensive, two major wins in my book. I told them exactly what I wanted (three tiers), exactly what color, and I told them to make it plain. No piping or fancy flowers on it. Just plain and simple. They thought I was crazy, I could tell, but look at the cake now! When I got the bright orange cake home, I whipped up a chocolate ganache frosting and spread it along the top and dripped it down the sides of the cake. The ladies at the bakery gave me some bright orange sprinkles because I asked ever so nicely, and because I was taking the cake home plain. I scattered the orange sprinkles along the top. Next comes shortcut #2- BB-8. On our last trip to Disneyland I had bought a cute BB-8 cup because I wanted to put him on my desk. This cup is so detailed and well-made that you would never know it was a cup! I placed him in the middle top of the cake, and he fit perfectly. 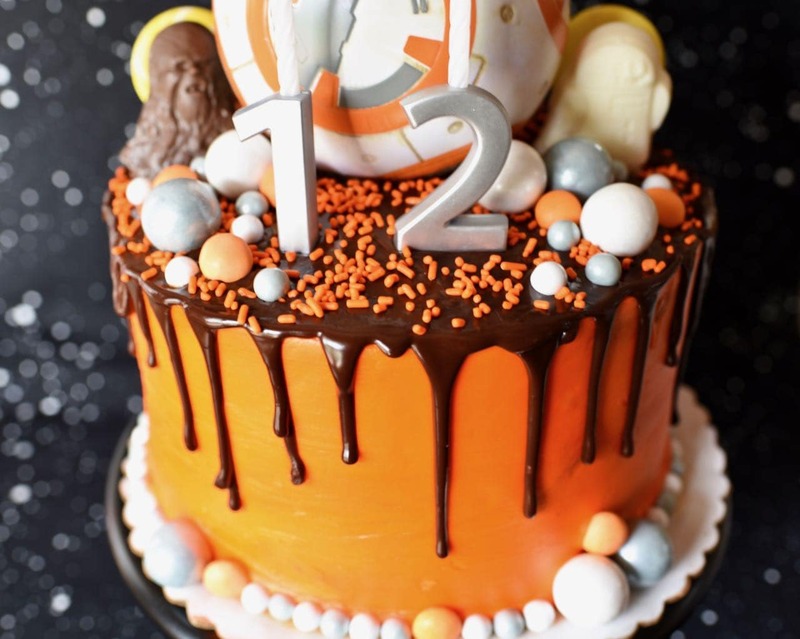 I placed white, orange, and silver gumballs around the base of the cake and around BB- at the top of the cake. I stuck a couple of yellow suckers in the back too. Silver number candle holders matched the candy well. 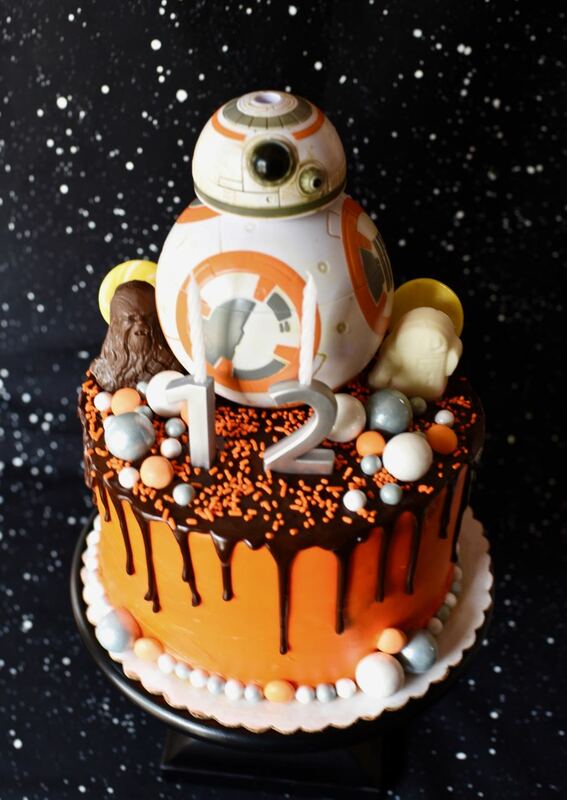 I made a chocolate Chewie and a white chocolate R2D2 from a Star Wars Jell-O mold I saw at the store, then stuck them on either side of the cake. These were such a fun addition, and were a cinch to make! One black trays in the center of the table held “Wookie Cookies” which were black and white cookies I bought that symbolized the light and the dark side. 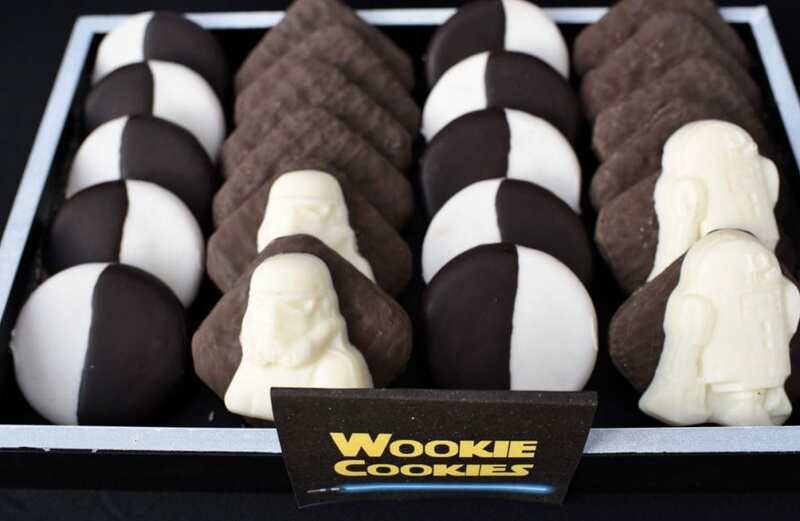 The other cookies were chocolate cookies I bought, but then added molded storm trooper chocolates to the tops with frosting. 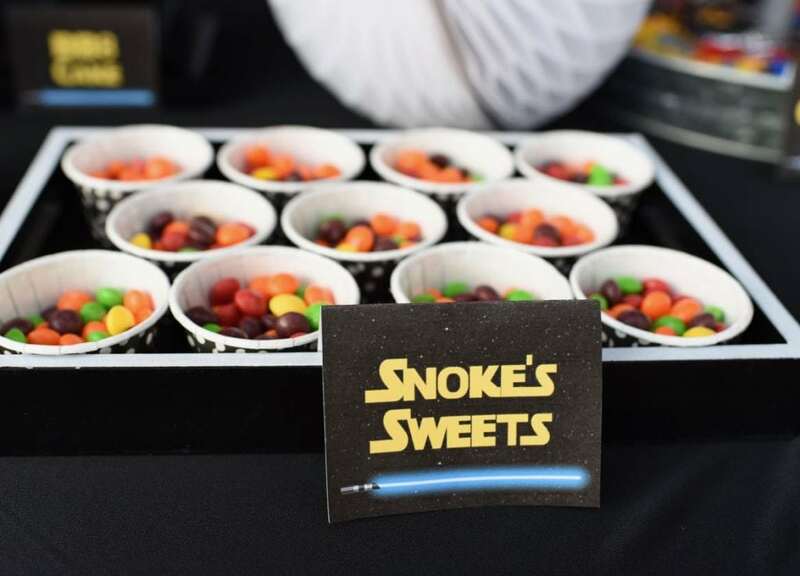 Colorful Skittles were placed into small black and white treat cups and labeled “Snoke’s Sweets.” Who knew Snoke had a sweet side? 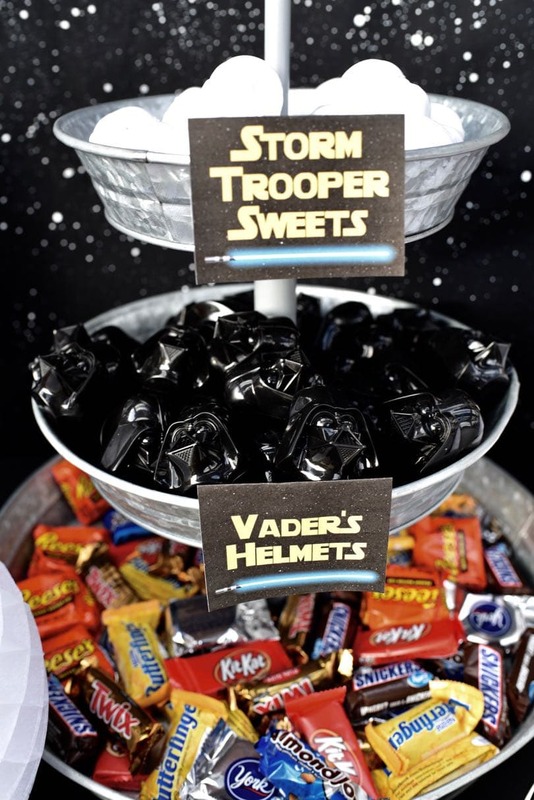 I was ecstatic to find white storm trooper and black Darth Vader helmets filled with candy. 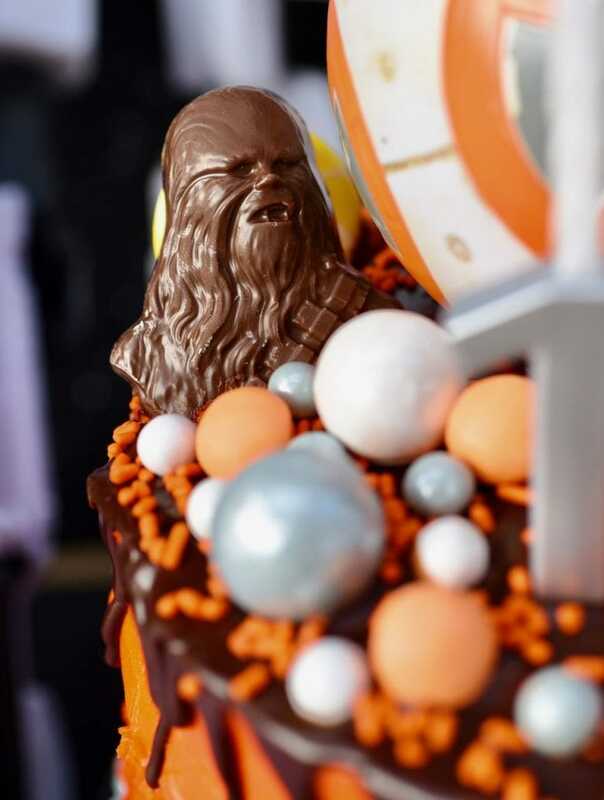 They were actually Easter eggs, but they just looked like Star Wars heads. The boys loved them! 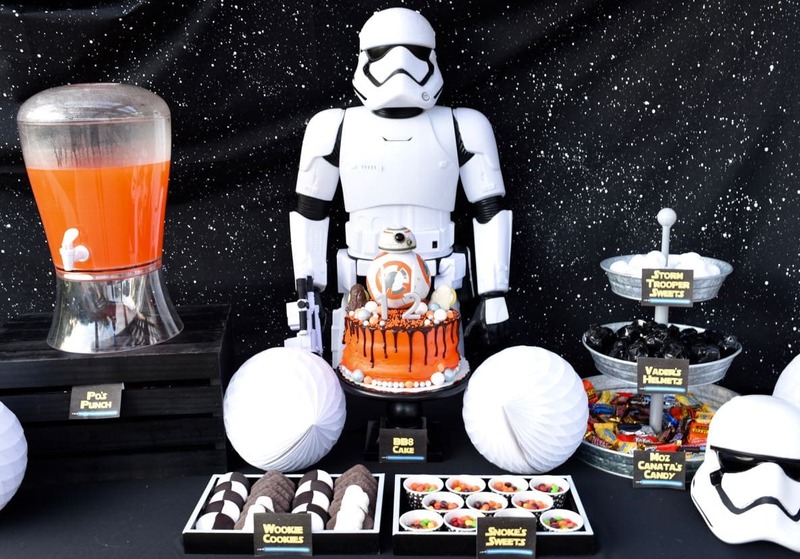 My big galvanized three-tiered tray was perfect for holding the storm trooper sweets, Vader’s helmets, and Moz Canata’s candy, which was an assortment of all our favorite chocolates for the party. 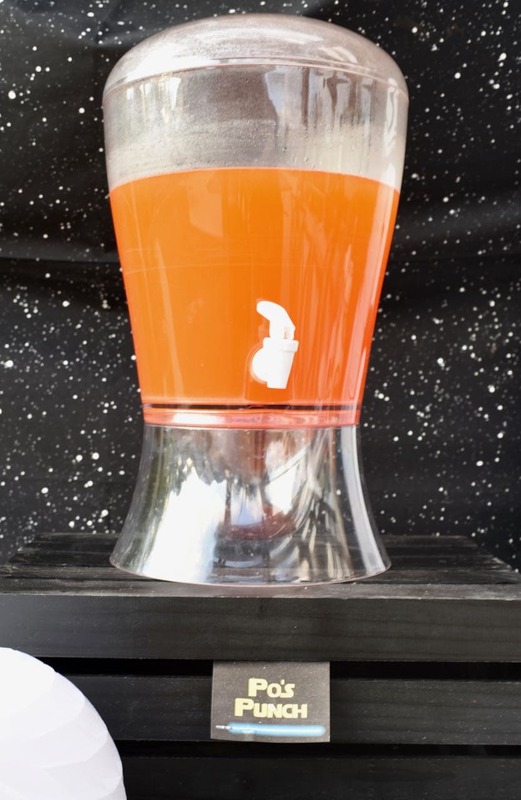 Bright orange Po’s punch was served, as well as a few giant pizzas and popcorn. Needless to say, the boys were stuffed by the end of the night. The biggest complement was given when I told the boys they could start eating. The tween boys all said they felt guilty eating from the table, because it looked so good and they didn’t want to ruin it! Thanks guys. 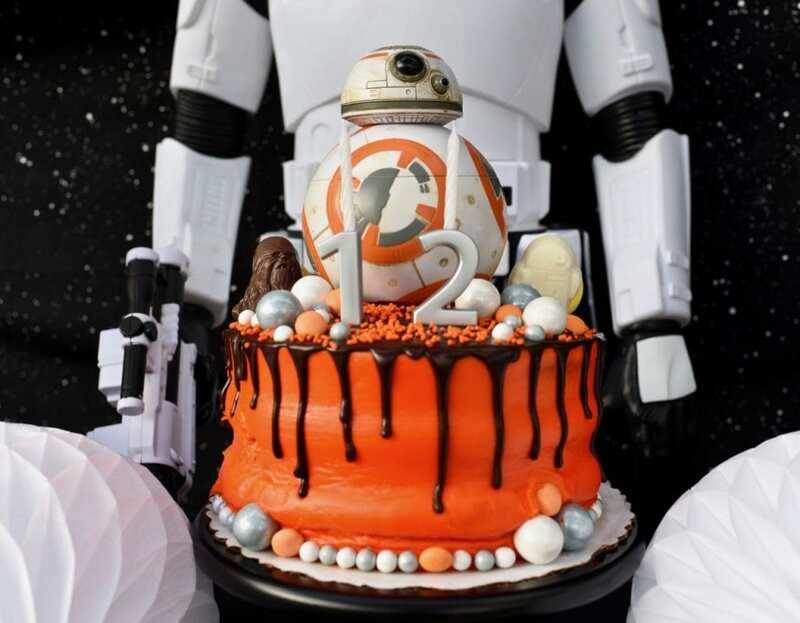 It was a really fun night, and I’m so glad my son could enjoy his Star Wars party with his friends. I know that it won’t be long until he doesn’t want to do these big parties anymore, so I’m gladly going along with it for as long as I can. 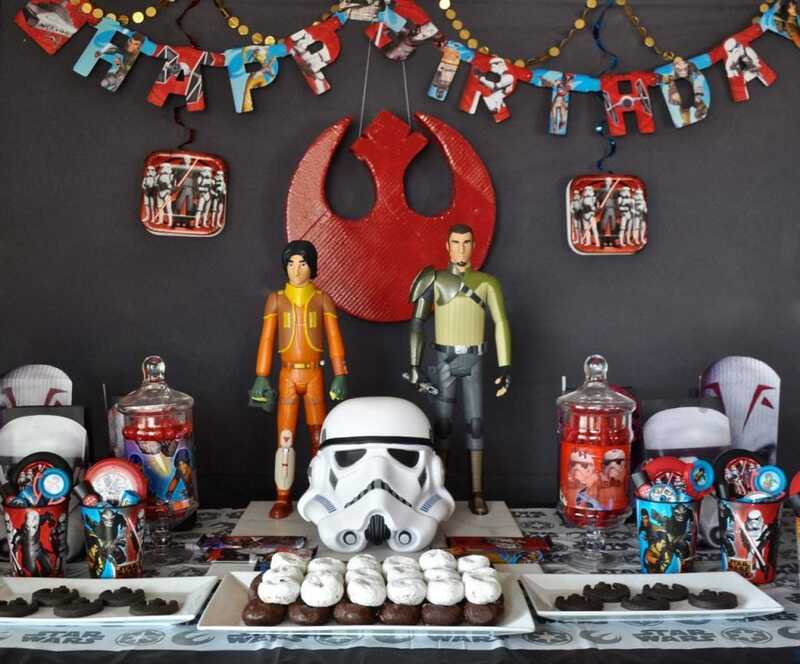 If you love Star Wars too, you might like our Star Wars Rebels party I created for my son the year before, including the DIY piñata I made from a cardboard box. We’re absolutely hooked on the show!